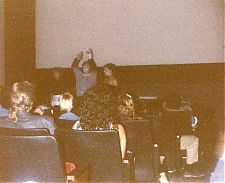 Before there were casts, there was just the showing of the movie. 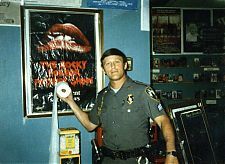 The Rocky Horror Picture Show began showing in the greater Providence area at the Showcase Cinemas in Seekonk, MA in the Fall of 1978. There was an approximate 13 week run on Friday and Saturday nights at midnight. 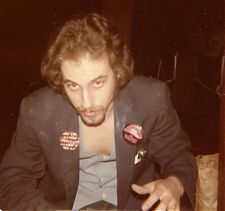 The only account we do have is co-founder Bob Andoscia going to the opening night. Some people came dressed in costume, but no local cast had developed yet. This likely emanated from word that there were the beginnings of other casts "out there" in NYC and Boston.If anyone from that short time period spots this and reads this, please reach out to me. 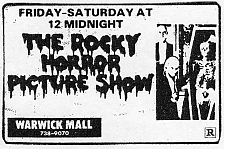 Meanwhile, beginning in the Spring of 1978 there was also an isolated showing of the RHPS at the Jane Pickens Theatre (JPT) in Newport in Spring and Summers. If accounts of timing are right, this was perhaps the first showing in Rhode Island. 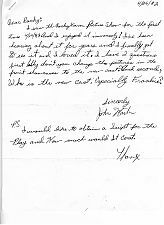 My account was from an informal discussion with owner Joe Jarvis. I questioned him to confirm it had began in Spring 1979, and he corrected me and said it was 1978. Again, no cast at first. 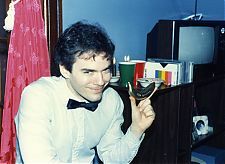 All I have been able to accumulate from that short period are a few stories from Robert Andoscia and the newspaper ad. I've extracted pictures of the facility off an internet video from a later time. The facility did not change in appearance in all it's years, so apart from being closed the current pictures from 2015 reflect what it looked like back then. The theatre closed in 2010 in favor of a newer Showcase facility in Seekonk. It is now an empty husk. Before RKO Army, there were other casts that we got our beginnings from. 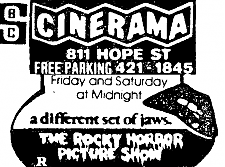 In February of 1979, the Cinerama on Hope Street in Providence became the regular home of the Rocky Horror Picture Show. 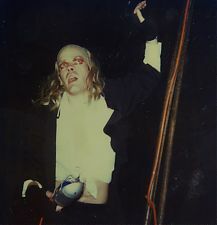 The area's first cast was the Providence RHPS Cast. 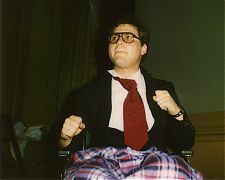 Bob Andoscia, who had gone to the first night's showing at the Showcase, was performing with them as Dr. Scott because he had a wheelchair. He explained the cast and audience participation to us. 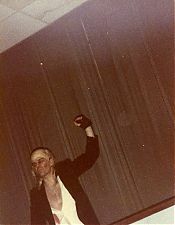 We became fans of the music from his RHPS album. Interested as I was, I held off going until I had attained my college degree. I promised I'd go once I had graduated college. Meanwhile, the movie scene down at the Jane Pickens Theatre (JPT) in Newport was continuing in Spring/Summer. No cast yet going. At that point, I'm not sure if anyone was dressing up yet there. The Cinerama on Hope Street was where the first cast of Rhode Island, the Providence RHPS Cast, performed. These are the only available pictures I've gotten, all from the Cinema Treasures website. The pictures of the Cinerama are from it's long history beginning as the Hope Street Theatre in the 1920's. 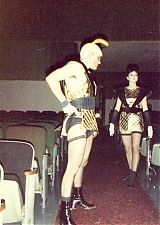 The last movie ever played at the Cinerama was the Rocky Horror Picture Show, and that show was the only time RKO Army (then the RI RHPS Cast) ever performed there. 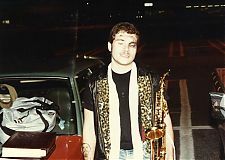 True to my promise, I made it to my first show on Memorial Day weekend 1980 immediately after graduating college. 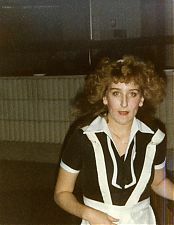 It was the same week I began my professional career. Finally, I saw all the music I had listened to in the last year come to life. This was like seeing a new color. At first, I did have some concern at first about the rowdiness of the crowd. However, this was Us. 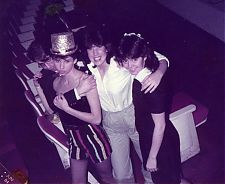 As young people, we were suppose to be into the prototypical high school or college party atmosphere. That never cut it for us. This was the ultimate alternative experience - And some of us really needed that. This was the coolest thing ever. It was a struggle getting involved, but I absolutely wanted to be involved with this phenomena. Meanwhile, the movie was still showing down at the Jane Pickens Theatre (JPT) in Newport in Spring/Summer. 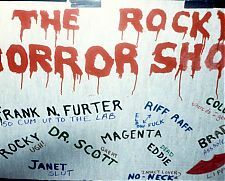 One of the fascinating aspects of Rocky Horror was that this was going on all over the country at the same time. Out of strong curiosity to see what "another" show would look like, I traveled down alone. It was there I meet Chuck Spaulding, who was the lone cast member performing dressed as Riff Raff. 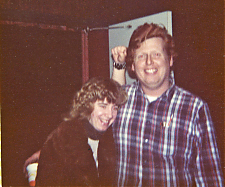 Bob and I were with the Providence Cast until June 1981. After a year, it did not work out personally for us between antagonistic theatre management policies and eventual cast conflicts. In no uncertain terms, Bob & I were gone. After we left, I gather their were more cast conflicts. Also from what I gather, there was no actual end-point. People just left the scene. In retrospect, despite the bad ending for us personally, I give the cast members much credit for accomplishing what they did under what became antagonistic theatre management. Everyone was very young and inexperienced in life. They were the beginnings in Rhode Island. It was about a 3 year run. At the time, that was a very long run. This was a cast that was not working off any known tradition. 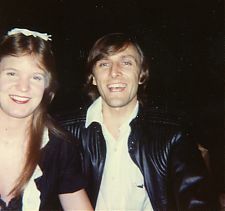 They were part of a growth spurt that was happening around the country of the unprecedented Rocky Horror phenomenon. They lasted long enough that the ending cast membership was very different from the original cast membership. The true linear trace of RKO Army begins in the summer of 1981. 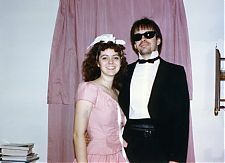 Bob and I were out of Rocky Horror, but despite our bad experience in Providence we still loved The Show. I had transferred to Newport for my job. There, I discovered the Show was again playing at the JPT. Bob & I checked it out. Chuck was still there, but he was no longer alone. We discovered some other newer cast members from the Providence cast that were also not happy with their experience there stop going to the Cinerama and instead went to Newport to get the opportunity to perform. 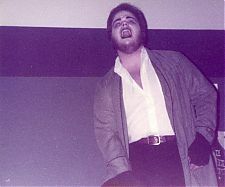 Thus began a 2nd and completely separate Rocky Horror adventure for us. This was the unforeseen origin of what we now call RKO Army. It was a coming together of like-minded people who saw Rocky Horror as something unique and special and that could be built upon. 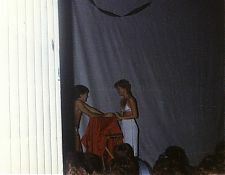 Having a place to do the show was needed, but the most important element of the relationship was at the Top. In complete contrast with the Cinerama manager, we had an owner in Mr. Joe Jarvis who gave us a Home beyond just a theatre. For a cast to go beyond mere existence and into a state of growth and improvement, it requires both cast desire and a positive venue. NOW we had that. Mr. J saw us as friends, not a burden. He cared enough to extend the run thru the fall and winter, which he had never done before. 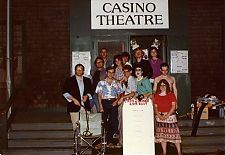 Because of that, we had our first Halloween weekend in 1981 (the year before in Providence the cast was banned from performing on Halloween weekend). That night it all came together. We had become a real cast. Unlike Providence, we experienced the concept of family for the first time that would become the key ingredient that makes all casts run. We became a real cast instead of people just showing up in this sense - We became organized. 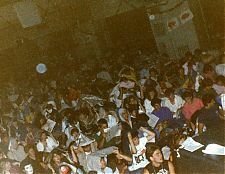 This may be a concept that people take for granted today, but previous to this it was a matter of people showing up and finding out at the show what would happen that night. Now, we actually communicated and planned ahead. There was still a separate Friday night group operating on the show-up-and-figure-it-out model, and we eventually brought them into our cast. 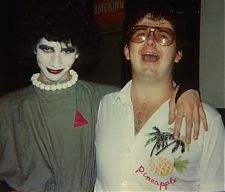 In no uncertain terms, Bob & I's Rocky Horror experience was over upon leaving (i.e. 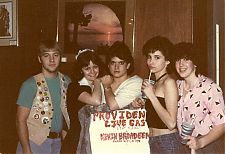 - getting kicked out of) the Providence Cast in early Summer of 1981. I had transferred to Newport for my job. There, I discovered the Show was again playing at the JPT. Bob & I checked it out and discovered a few others also not happy with the Providence experience had been going there. Thus began a 2nd and separate Rocky Horror adventure for us that became the unforeseen origin of what we now call RKO Army. Kodak Instamatic Photo's by Robert Andoscia. 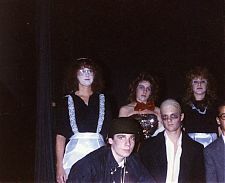 This Halloween show was the first "big night" for us as a cast. Owner Joe Jarvis arranged for a professional photographer to come in. 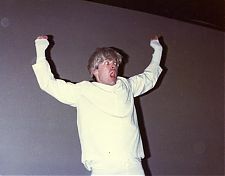 This was in contrast to one year earlier having the manager of the Cinerama not allow a cast to perform on a sold out Halloween night in 1980. We continued to grow in 1982. We began our own weekly newsletter, a streak that was to continue every week we had a show for over 10 years. We did our first road show at the UA Theatre in Groton, CT. 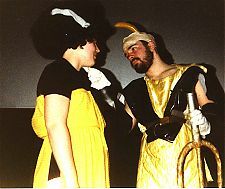 Audience members saw us do a few shows there and formed their own cast ("Hedonistic Theatre"). 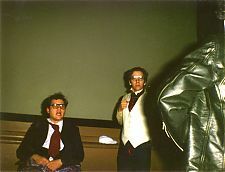 We did our first non-theatre road show ever at URI on May 1, 1982, a double header. We were proud of what we had created. We had something special. We had a cast that acted professionally and got along. We proved that being serious and having fun were not mutually exclusive. We had props and could store them. We had regular lights. This was all part of the Genesis of the RKO Army, then called the "Newport Rocky Horror Picture Show Cast" (In those days, there were no cast names). Meanwhile, we gathered news from Providence that the original cast up there had indeed faded out sometime early in 1982. 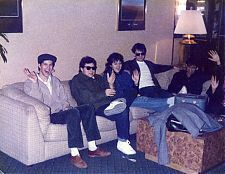 Later in 1982, a 2nd cast formed in their absence with completely new leadership. Other than perhaps two carryover cast members, it was a completely different group which was established when previous leadership attempted to come back in a few months into it. Our run ended after a year in August of 1982. We were dead in the water. 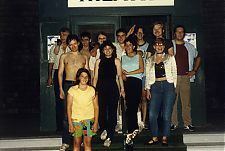 We did a 3rd road show at the UA theatre as per a previous agreement with that theatre, but a new cast was just getting started there so we knew that would be our last. 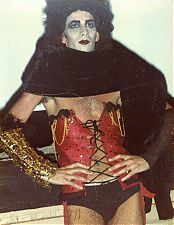 Those of us still with a love for Rocky Horror and willing to travel found avenues. Some of us joined up with the newly formed Groton cast and made new friends there while we lost old ones from Newport. Some of us also started to make our way into the 2nd Providence cast. Being part of those two casts kept us going when we had nothing else. Picking up a good idea the Providence Cast had done occasionally, I began the weekly newsletter. Published everywhere we went every week until 1991. Audience connection. All photos had exposure and sharpness modified by either Adobe Photoshop Elements or Mac ColorSync utility. First live performance of a cast at Groton's UA Theatre. Near beginning of a 10-year run of the movie there, with 3 casts. We did one more show there in June. At that point, the first of 3 Groton casts was just starting - Hedonist Theatre. 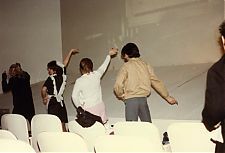 Photo #2 of the audience shows what i am 90% sure is Jim Fulton, who co-founded and co-lead that cast along with Tony Boucher. Photo's by Robyn Tierney's Mother. Last Friday night show at Newport before run had ended. Last Show at Newport before run had ended. After show, we thought this may be the end for us as a cast. A few of us continued to perform in the Groton Cast. However, that 2nd Providence cast also came to an end. 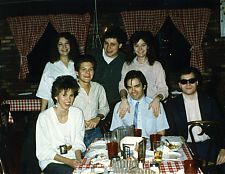 In early 1983, a 3rd very informal "cast" formed. 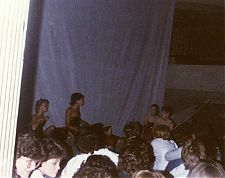 It was known as the "T Shirt and Flashlight" cast as it was basically just an incomplete group getting up and performing what they could. It was made up of a few Newport cast members plus a few from the first Providence cast. No spotlights, just flashlights. Costumes were at a minimum. They were not getting in for free as cast and there was no cast leader. But the movie was still playing their on Friday and Saturday nights on auto pilot. Then, something unexpected happened. We learned thru the "T Shirt and Flashlight" cast that the Cinerama was coming to an end. We went there on the last night under cover sneaking in as members of the T-Shirt and Flashlight cast. We needed to sneak in because the same management was still there. We did the last movie ever run in that building on 3/19/83. It was an epic night, sold out. We went into the movie expecting to be thrown out as soon as each of us got up and performed but we were at least going to get our "moment". I recall the Jerry the Manager coming in and seeing us, but he just let it go. It was the only show RKO Army could say we did as _this_ cast at that special place in RHPS history. Ironically, the last ever picture show at the Cinerama was what pulled us and the remaining Providence/Newport community back together and launched us into what would become our history. The Cinerama ending was actually a great opportunity for our cast. We were never going to get it going under Cinerama management, but now it opened up the possibility of getting it going again at another theatre. It's ending allowed us an opening to get a foothold and a fresh start at reviving our cast. It's unfortunate, but the unforeseen Death of the Cinerama had to have occurred to remove the unmovable roadblock for this cast to Live. 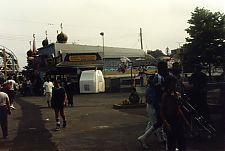 The Cinerama was destroyed by wrecking ball in the summer of 1983. From the rumble, we have pieces of it's brick. It was replaced by a CVS, which is still currently thriving there now. The CVS store and it's parking lot are in the same exact spots that the Cinerama had been. Genesis complete. This era was marked by 3 relatively brisk runs. Getting back to Providence, we changed our name from the "Newport RHPS Cast" to the "Rhode Island RHPS Cast". The Avon, located in the midst of Brown University and just down the road from the defunct Cinerama, was not going to let a cast in. A parting gift from the Cinerama management was telling the Avon that having a cast was trouble. The Avon could generate a big house without a cast. It was difficult, but we made our case that we were an asset. We were given one chance. One mistake and we were out. Tough, but for us it was opportunity. We challenged ourselves to have a full cast both Fri and Sat nights. Previously, Fridays were seldom casted. Not enough people. 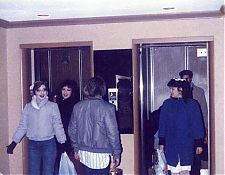 Many of our Newport-based performers stayed with us. We then recruited previous Cinerama and Groton cast members who shared our vision. For the first time, we had a full cast on both Friday & Saturday nights. For years, that the Friday and Saturday night casts were different sets of people. The Cable Car Cinema and Cafe was next. A more relaxed venue, we learned how to do the show in a tiny theatre of couches with less space to perform than many living rooms. We were allowed to again run the weekly newsletter that the Avon would not allow, and that was to go on for another 9 years. Finally, there was the Fairlawn. Local theatre in a run down part of town. Seedy crowd. By any standards, not a "safe place". Torn down soon after we departed. Best thing about this place was the owner. Very friendly man, George Mittsmenn. After these 3 runs, we were becoming quite resilient by going from one venue to another with little commonality. These experiences taught us to use discomfort as learning experiences and see change as opportunity. I regret that we got no pictures at either the Avon run or the Fairlawn run. After making this newsletter and bringing it to show, we were told we could not have a newsletter at the Avon. Not wanting to push our thin-ice luck, we of course acquiesced. It was great to be allowed to have a newsletter again. The Warwick Mall Cinemas (WMC) afforded us a longer run than the 3 previous cinemas combined, but we faced violence at these shows. It could be that this was the first time the Show had gone to the less artistically-progressive suburbs. 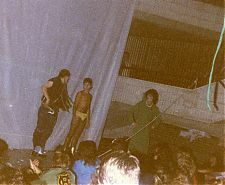 Some of the audience came to cause a problem with the fish-net wearing cast. There were fights. 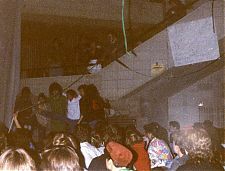 There was theater destruction. There were cast walkouts on 2 nights. There were calls to police. Once, there was an ambulance for a severed artery in a customer's arm. Hard for people today to imagine. Large audiences. Inept management. Pull together of an old and new collection. They were not identical, so they were synced. The old collection was scanned in at a high pixelation level. To fit, each picture was optimized thru Adobe Smart Fix and then downsized to Med to make them reasonable. Cast that performed while we were on road show in Newport. Beginning of our friendship with the new (2nd) Groton cast. They had us guest perform down in their theatre. Our last show here had been before they formed their first cast. One of 3 sets of photos. While there was some overlay, there were too many non-synced differences to one common link. Based on the large scan size, these may have been from negatives. I forget. To fit, each picture was optimized thru Adobe Smart Fix and then downsized to Med to make them reasonable. Cast party at Sheilarae's apartment on east side of Providence. Roy's house in Johnston, RI. Tandy D, Charley A, Steven M, Lyn R. Roy looking on. Looking at maps figuring out how to drive to Harvard Square Theatre in Cambridge. We had a 6-month gap before our next theatre. It was not wasted. We developed a sense of community by working and exchanging with the 2nd Groton cast and reaching out to the advanced Boston Cast. It was a very big moment for us that we performed a show at their Harvard Square Cinema in front of them. We looked up to them. It brought out our best. We took better charge of the violence problem at the Cumberland Twin Cinemas (CTC), instituting the "search" as people walked in. This was finally a place we could call "home" again. Ownership was the ultimate Mom & Pop, Paul & Barbara Anderson. They cared about us. We were treated well for the first time since Mr. Jarvis. We could actually store props again in the theatre instead of bringing them to/from the theatre every show. We started MC-ing before the shows (Previously, shows began with audience screaming "Lips!" until the movie started.) 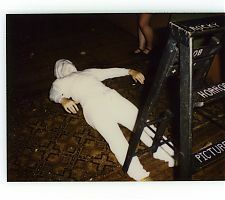 At this point, we had gotten beyond the challenge of filling the roles every night two nights a week. Could not match these up with any one date. We also had grown to the point we could take on the occasional road performances at a 2nd cinema (the Avon again) while still casting the primary one. CTC was forced to close due to economic reasons after a 2 1/2 year run. A tearful ending, but great memories. Given the trend of cast names, we decided on the "Absolute Pleasure Players" ("Creatures of the Night" was used but never stuck). The A.P.P. Era marked a first great age for the cast. All of the experience came together as we started at the Meadowbrook Cinemas (MBC). We built better props and had better lighting. We developed a tech crew. Before that, Riff Raff moved all the props. If you had no one on Lights, Eddie and Dr. Scott handled it. We had the Show running like a business. We were attracting talented and wide-ranging people. We began doing live preshows. We started doing 4th of July parades. Some cast members were going to cons and seeing a bigger picture. The MBC run broke the seemingly unbeatable Cinerama 4-year record. We also starting sending a 2nd "B" cast down to the again-running Jane Pickens Theatre in the summers. We were bigger and better than ever. Unfortunately, we were not wise enough to manage some of the internal issues that success and popularity can bring. Part of the reason the cast was getting better was because it was larger and bigger. It was no longer a close-knit group. Our managerial experience of today was not present then. Conflicts exceeded solutions. We had great internal upheaval, but we did learn and eventually handle it. We replaced rules that could be twisted with reason that we could openly communicate about. Having gotten past internal issues, soon external issues with ownership were reaching intolerable levels. A more experienced and wise cast is going to see and be less tolerant of bad practices. Self-destructive tendencies and policies by the owner were limiting our ability to get better. At best, we were stagnant. We decided almost unanimously to leave in 1993 after 5 1/2 years with no sure prospect that we had anywhere to go. However you look at it, it said something unique that this large cast decided almost unanimously that cast death was preferable to stagnation. Make no doubt about it - We did pay a price by not having a regular venue. There was no immediate reward for doing the better thing. We did eventually get into the JPT with our old friend Mr. Jarvis, but it took 5 months. It was a nice run, but it only lasted 9 months. Like 12 years earlier, year-round attendance simply couldn't support it. And then there was nothing. During this open period of time, there was no home theatre on the horizon. 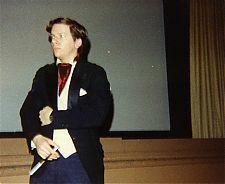 We did many road shows in Rhode Island, Connecticut, and New Hampshire at theaters, colleges, and clubs. We truly learned the ways of heavy duty travel during this time. It was a practice that would serve us in later years. The one we visited most was the Attleboro Movie House, where we showed it in 16mm, until we found out the manager was bilking the revenues and it ended. The one good thing that did come from that manager was a tip on another theatre in Framingham that led to the creation of the Teseracte Players. Parallel operations becoming one mark this transitional time. The APP operation was without a home theatre doing what needed to be done to keep the cast alive. All difficulty aside, we did learn a lot. We continued to seek the semi-regular road shows and got them in Southern New England. Now the most visited venue was the Starlight Dinner Theater in Hartford, CT. We also worked with the new cast, the Teseracte Players. We even developed a 47 minute Rocky Horror slide show that was built for small venues and generated a dozen performances at AS200 in Providence. We were still able to land those really "big" road shows like The Guarde in New London and continued big events like the Bristol Parade. We could do a lot when we had a place to do it. Also, without a regular theatre, some cast members began to fade away in availability. The other operation was going on back at the MBC. In the 3 years since we had left, the movie was shown but none of the new casts emerging stayed around for long. In that time, there had been multiple casts and 12 different cast directors that came and went. However, finally, one young group did emerge and stay that was refreshing and impressive. They were called the "RKO Players" who began in 1996. The one improvement that they had since we had left the MBC was that ownership had taken a step back and management was thus able to do a better job. In 1997, the RKO Players had a group of disciplined young actors. APP had experience and equipment. The Absolute Pleasure Players and the RKO Players just ... became one. This was the greatest non-story in our history. It was not planned, negotiated, or agreed upon. There was no "agreement" or "merger" to settle anyone's ego or role. There were no proclamations. This was not "2 casts working together". There was no period of adjustment. There was no identity of being "RKO" or "APP". All cast members just started doing all operations either one had previously developed as if they had been together all along. It was all about the Show and the focus was on the events rather than the group or any individuals. We had more memorable nights again here. The biggest was week 600, when we first did Shock Treatment. 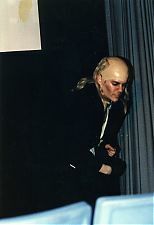 In early 2000, the almost 13 year run of RHPS at the MBC, and the MBC itself, came to a grinding financial end. The Park Cinemas was a one-year run. It was dusty and starting to decay, but it served it's purpose as a place to go after the long running MBC had ended. There is nothing eventful to report here except the ending. Without warning, right during a show, we discovered the cinema was abruptly closing and we had to clear out at the end of that show. The theatre was closing for renovations (that would go on for 8 years). Next, it was back to the building that had been the Meadowbrook, now under new ownership and called the Limelight Cinemas. This was a short but positive run. Unfortunately, the business ended there after 4 months. We next went to the Castle Cinemas with high hopes of another "home". It was a small cinema in disrepair but about to get remodeled. Ownership had dreams of "maitre d". After the first few months, we took time off while the remodeling was done. After remodeling and opening a restaurant/bar, it became Castle Cinemas & Cafe. We were excited to be part of all this. Unfortunately, promises made were broken. Ownership was a disaster with ill-conceived business plans. They dribbled out one good manager after another until finally at the end they achieved a management level equal to their own ineptitude (aka "Crazy Burger"). We were at the Castle for 2 1/3 years. It ended terrible with management asking us to leave as an unwanted element. We cleared out, and they predictably went out of business a few months later. Combining the failures of the Castle ownership, the tininess of the theatre, the lack of parking, and the high crime in the area, we could only do so much there. Internally, the negative of this time was that we were reverting back to being a more insular cast. That stymied growth. On the positive side, the cast did have a rejuvenated enthusiasm level. There was "buzz" in the cast that had been missing. We had become balanced enough that we could start doing some one-off alternate movies. This success set the ground for later productions. We also had a concurrent monthly run at the Pastime Cinemas. It was during this period that the cast changed it's name to the "RKO Army". By the very end of this run, upon exiting the Castle, we were poised for major change. What created the Modern Era was a decision to take control of what we were going to be, instead of being whatever happened to us. If we were going to continue to put time into the Show after all these years, it had to be a worthwhile. What I say here is not a reflection on other cast practices. It is a reflection on where WE were, how we felt about it, where we wanted to be, and what we needed to do in our own situation to get there in Southern New England without the support of a big city to perform in. Gone would be the days of weekly shows for us. They would become monthly to make an event out of it rather than a hangout. Gone were the midnight start times. The earlier the better, to get more people in. Gone were the days of letting anyone into the cast just because they wanted to be in. Now it was a matter of who *we* wanted in the cast. Gone were the days of tolerating characteristics that caused failure and distracted us from achievement. It took 6 months to find a new home. It began with a 1st Friday of the Month at the Holiday (later Island 10) Cinemas. Given that we had 3 other open weeks, we eventually started doing 2nd Fridays at the Triboro Cinemas. That theatre closed, but soon we replaced it with East Bridgewater Cinemas, where we meet another true manager, Carrie, who always fought for RKO Army. Two years later, we followed Carrie to a 3rd cinema for the 3rd weekend at South Kingstown's Entertainment Cinemas. This was enough. However, the opportunity to do a 4th theatre at The Orpheum opened up. We could not pass that facility down. One cast. Four regular run theaters. We built props for all theaters. We upgraded technology for all theaters. 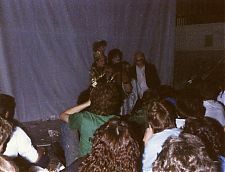 The talented people in the cast attracted more talented people. The show and preshows grew to a level beyond the past. 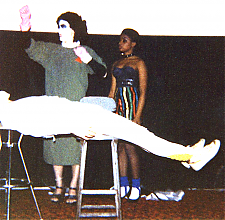 We also went beyond the traditions of Rocky Horror and Shock Treatment. We added REPO!, Dr. Horrible and Buffy. This attracted even more people, and it contributed to made our Rocky production better. Theme shows took on a new level of quality. Cast retention also was at its best ever. After 3 full decades, I'd never seen it better. This was a 7 year train ride up the mountain. We just "did it". RKO Army also began attending more and more cons in increasing numbers. It became a bigger world out there for us. The larger community taught us and inspired us to keep getting better. "CON ERA" is not due to RKO CON in 2013. The "Modern Era" ended with the loss of 3 of our 4 monthly run cinemas and with the tremendous influx of opportunity to perform at conventions. Given the 5 aforementioned productions we do, and with the addition of Firefly and Serenity and The Devils' Carnival, we found quite a commonality in the convention community where we can share passions with other like-minded people. Among others, RI Comic Con, Connecticon, Temple Con, Total Con, and Arisia Con have provided great audiences. SuperMegaFest provided the greatest audience because it included Pat Quinn and Barry Bostwick in the front row. The Pride Parade is a wonderful celebration to be part of. Local universities and clubs and comic stores have provided great audiences. Shows at the Zeiterion and Mendon Drive-In provide a massive audience and experience. No two RKO shows are the same anymore. We have regular runs, semi-regular runs, annual shows, all the cons, and all the one-offs. I wrote for the con booklet in 2013 "I don't know how long this era will last, but it's taking the excitement of what we built and letting us display it to greater audiences." Nothing to change on that. There's less to analyze here because it's too soon to look back. This has been the most interesting period of our existence. This period has gone beyond our visions. As we go deeper into it, we know less what to expect. We are grateful to the people who come to our shows. We are honored by members of other casts who come to perform with us. 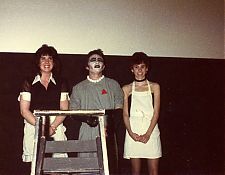 In the beginning, we knew this "Rocky Horror thing" was special and we enjoyed it locally. It has developed and grown around the world giving us experiences we never imagined.